OL5 The English Lakes North-Eastern Area. 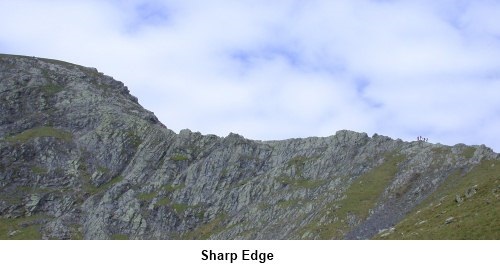 Introduction: Sharp Edge is definitely a walk with the “wow” factor. 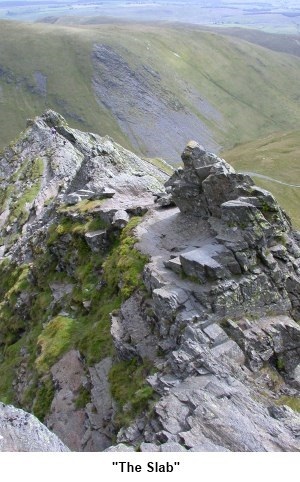 Although not a particularly long walk, it is probably one of the most exhilarating you can do. Unfortunately this also makes it potentially dangerous. Do not undertake this walk in windy, icy or even wet conditions, nor if you have any “vertigo” problems. 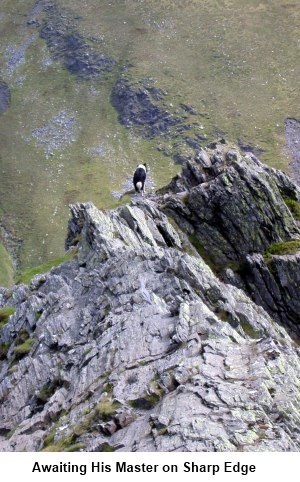 It is not called Sharp Edge for nothing and in places are precarious footholds above long drops which would be likely to prove fatal if you fell. However, not to get things out of proportion, in good conditions, with common sense and taking your time it is a truly great walk. I have done it several times and I am still here to tell the tale. Start: The walk begins at some rough parking behind Scales just off the A66. (NY 349272). The A66 is a fast road and it is easy to miss the turn. Look out for the road sign to Scales off to the north side of the A66 between Threlkeld and the turn to the south for the A5091. In Scales (barely a hamlet) take the lane at the eastern side of the White Horse pub. After just short of half a mile, there is a sharp loop in the road and immediately after it is the parking (NY 349272). There is not very much of it and at weekends/Bank Holidays, you will need to get here early to secure a spot. The lane is narrow and there is not really anywhere else to park. To begin the walk, head back just past the loop in the road and the footpath turns off to the right. The path climbs steadily and at the top of a rise, look out for a path heading across to join another (NY 347298) which follows the valley of the River Glenderamackin on its south west side. Do not stay on the original path and cross the river. Follow the obvious path parallel with the river for about three quarters of a mile. 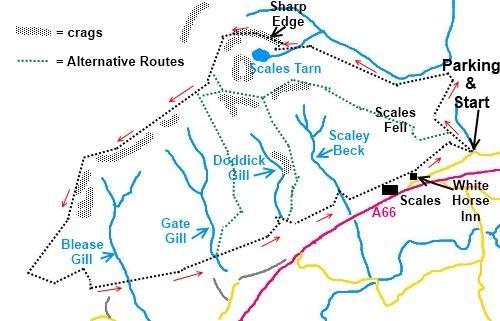 Here is bears left to Scales Tarn (NY 338282) with Sharp Edge towering above to the right. From Scales Tarn, the hard work begins. The approach to the ridge is pretty obvious and you begin to climb it. To do it “properly”, you should stay as close to the top as possible and there are spots where you can stand with one foot either side of it. Then you really appreciate the exposed nature of this place. Here and there are paths which avoid some of the more exposed places, should you wish to use them. Fairly unavoidable about half way along is “The Slab”. This is a flat section of rock on the north side of the ridge, probably about four feet wide. Because it is on the north side and in the shelter of rocks, it never gets any sun. Even in otherwise good conditions it is often damp and greasy looking. To aid the adrenaline, over its edge is a sheer drop and to crank things up a bit more, it slopes very slightly towards that drop. Crossing this always leaves me feeling a little uneasy. 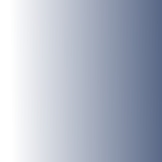 It is probably not as bad as it always feels. Just take care and do not feel too ashamed to crawl across it if that makes you feel more comfortable. I have seen many people do this. Beyond the “The Slab”, eventually the ridge peters out at a fairly daunting rocky face. This is by no means a vertical rock climb but it does require use of hands as well as feet. If you have been using walking poles, this is a good time to put them away until the descent. 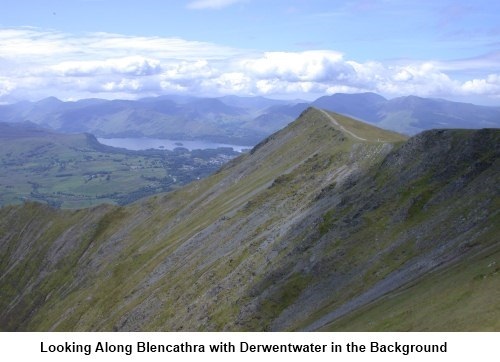 Once you reach the top of the climb on to the top of Blencathra, take a deep breath. Be sure to look back and appreciate the dramatic ridge you have ascended. Now head south westerly to the summit cairn (NY 323277) and follow the edge to Knowe Crags and Blease Fell (NY 311270) (if cloudy, set the compass bezel to 232°). 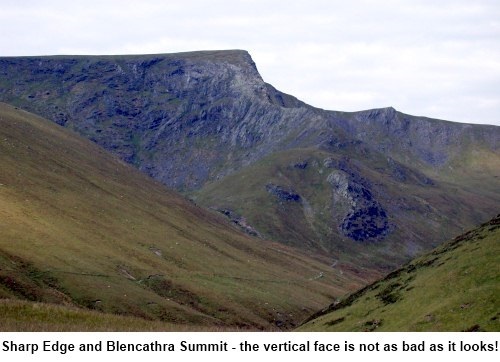 This is the route for this walk but if you look at the OS map in conjunction with the sketch map, there are a number of alternative routes off Blencathra which can shorten the walk if you wish. They all lead down to the path this route eventually joins. From Knowe Crag, a winding, knee testing path descends the fell until it meets another path (NY 307261). Turn left here and head down until you reach a wall which runs along the bottom of the fell (NY 313260). The route back to the car parking area now essentially just follows this wall all the way back, passing to the north of Scales itself. Shortly afterwards, it joins the path you originally took from the loop in the road and you turn right.